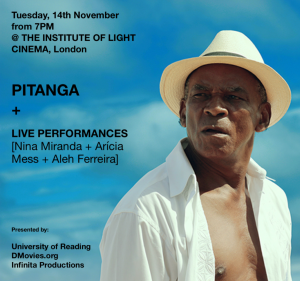 Infinita Productions, DMovies & University of Reading hold this special screening of short film Novo Barravento by Eder Santos Jr and Bruce Yonemoto and documentary Pitanga by Camila Pitanga and Beto Brant on 14th November 2018 @ The Institute of Light, IOL Cinema followed by Q&A with actor Antônio Pitanga and co-director Camila Pitanga. The documentary Pitanga investigates the aesthetic, political and existential trajectory of emblematic Black Brazilian actor Antônio Pitanga, who is now 78 years old. His career spans over five decades, and he has worked with iconic Brazilian filmmakers Glauber Rocha, Cacá Diegues and Walter Lima Jr. He was a prominent figurehead and outspoken activist during the Brazilian dictatorship, a period of unrest in Brazilian cinema. Pitanga deep dives into the world of Antônio and the history of Brazil. The documentary was co-directed by his daughter Camila Pitanga, one of widely recognised faces in Brazilian television and cinema right now. The film is also a poem, and a tender ode to fatherhood. The screening was followed for a Live Performance by Nina Miranda, Arícia Mess and Aleh Ferreira and the reading of an Manifest Against Censorship in support for Brazilians arts in their diversity and against censorship.